A recent reading of “The Interestings,” about friends who first meet at a summer camp for the arts, spurred thoughts about the nature of talent. The degree to which talent is exemplary enough to be career-worthy, vs just being an avocation or amusement, can provide fame, income and a career – or bitterness and heartache, depending on the ability for objective analysis about one’s depth of talent and the world’s value on it. Even exemplary talent needs the right circumstances to thrive – cultural / marketplace opportunity, timing, financial backing, mentor sponsorship, business / networking connections – along with other qualities in the talented (perseverance, work ethic etc). Public appreciation for talent doesn’t always last over time, and sometimes the talented veer onto other paths with their gifts, or find their “run” cut short by age when their talent is tied to physical ability. I frequently contemplate the nature of talent and its expression when viewing art, especially by artists I know. 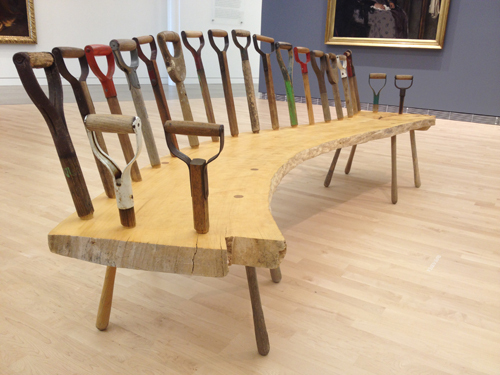 A recent trip to the Museum of Wisconsin Art stirred up more thoughts about talent and how these artists have acted on their talent. 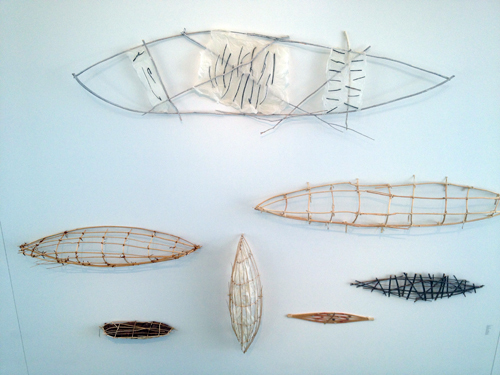 Canoes by Truman Lowe on display at the Museum of Wisconsin Art. I was privileged to study under Truman during his tenure at UW Madison. There are many potential paths for artistic talent. A classic path aimed for by many of us earning our MFAs was the university professorship combined with a healthy schedule of gallery exhibits and possibly punctuated by a fellowship or guest artist stint at other universities. The “art star” talent path is less regular and burns brighter: No regular professorship but perhaps occasional guest lecturer / fellowship gigs strung together with grants, artist-in-residency postings and hopefully semi-regular press in major art publications. A comparison between “classical” art careers and my own is inevitable, but these days it follows a more meditative and less self-critical path than it once did. I too contribute to the artistic arena by producing and selling art. My earlier work was self-reflective and sometimes poignant, shared with the world via gallery exhibits. 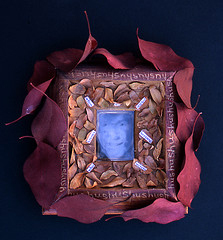 “Who knows when we started keeping secrets?” Mixed media piece with photographs on transparency film, leaves, words and etched wood. My recent art is decorative and seen online or at craft shows, and the pace of creating / showing has been erratic at best this past year. 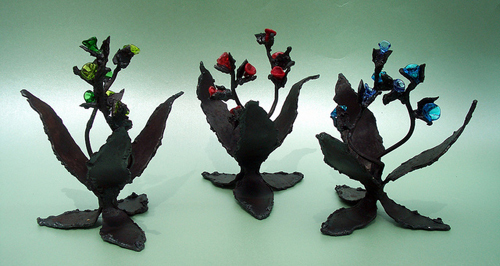 Welded steel plant sculptures with lampworked glass flowers. My artistic output now occurs in much different spheres, to different consumers, and at a widely irregular volume than it once did. I have begun to realize that the conversation and commerce exchanged about my art now is just as valid a contribution as what I contributed in a different, more regular and traditional way earlier in my career. This sense of equilibrium with my talent is new – being comfortable with contributing on a very different scale than I used to, and vastly different than some of those with whom I studied and mentored. Like the characters in “The Interestings,” I am reaching my own level of contentment with my talent, how it is expressed – and how much of it I draw upon for my sense of identity. 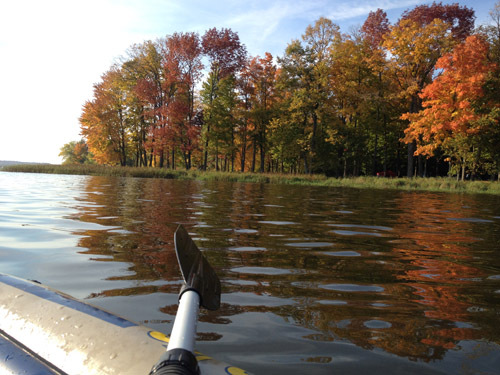 Kayaking and hiking feeds my art, spiritually and literally: I was a photographer long before I sculpted, and make yearly calendars of my water photography.